This is my entry for the December 2010 contest in the gnomon workshop forums. The theme is Beauty and The Beast. I've had the idea to do this piece for months. 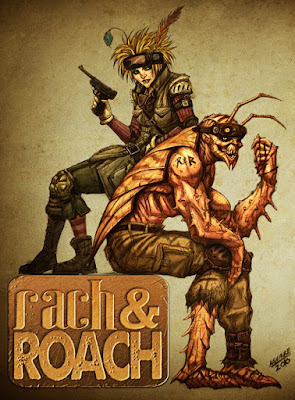 Every time I watch Friends re-runs and I hear them say Rach, I always think of a couple called Rach and Roach. It is a couple of post-apocalyptic mercenaries. It is a young woman and a half-man half-cockroach mutant. Just goes to show that inspiration can come out of the most unexpected places. Hope you like it.